This is a general term used to describe any abnormality in the lumbosacral region. The most common cause is a straightforward disc herniation between the seventh lumbar vertebra and the sacrum (often termed L7/S1), which is the last disc in the spine. The classic clinical signs are low back pain and a reluctance to jump. Paralysis does not occur although some dogs will become a little weak on one or both rear legs. Cats also suffer occasionally from disc problems in this area. Diagnosis is best made by either a CT scan or by using an MRI. Each imaging technique has it advantages: CT is usually more readily available and less expensive and it gives better images of bone whereas MRI provides better images of soft tissues. Figure 10-1: Cross-sectional CT scans through the lumbosacral (L7/S1) disc of two dogs with their spines in an extended position to exacerbate nerve root compression. A: Cross-sectional image from a dog with a normal lumbosacral spine. Note that the nerve roots, which appear light grey on the CT scan (just above the arrowhead), are surrounded by a darker grey tissue that represents fat. Fat can seen surrounding the nerve roots as well as around the muscles in this region (arrows). B: Working police dog with a severe disc extrusion containing small flecks of white, calcified disc material (just above the arrowhead) that is compressing the nerve roots. Fat is evident between the muscles (lower arrow) but there is almost no fat around the nerve roots (upper arrow), as it has nearly all been displaced by the disc material. In some dogs the nerve roots are compressed not only by a disc herniation pushing upward but also by fibrous tissue or bone pushing down from above and from the sides. Tissue compressing the nerve roots from above is shown in the MRI, below. 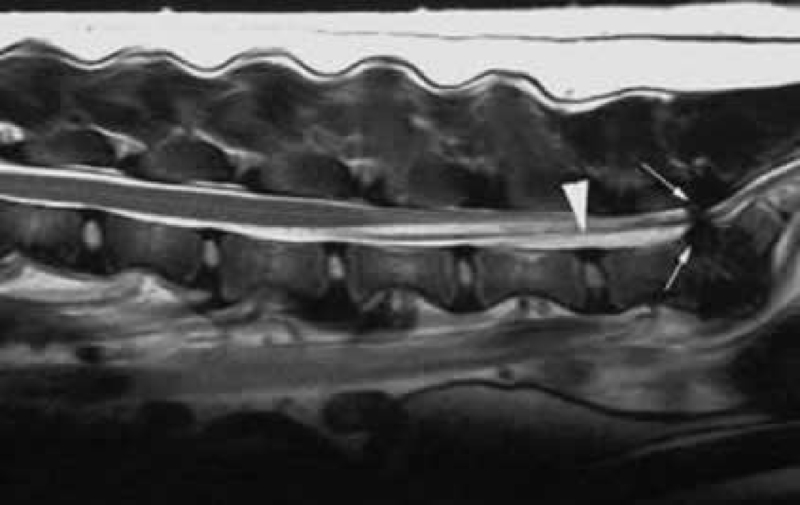 Figure 10-2: Sagittal (essentially meaning a view from the side) MRI of a dog with low back pain to show a large lumbosacral disc herniation that is compressing the nerve roots from below (bottom arrow). The nerve roots are also being compressed by soft tissues from above (top arrow). The nerve roots are shown by the arrowhead. A final component of lumbosacral disease is associated with abnormal movement of various structures in the area. In normal dogs this area is subject to considerable movement. However, in some dogs, failure of the L7/S1 disc allows the sacrum to slide underneath the roof of the seventh lumbar vertebra and cause further compression of the nerve roots. Figure 10-3: Colorized, 3-dimensional reconstruction of a CT scan to show how the nerve roots get compressed by bone in some dogs as the spine changes from A: a flexed B: to an extended position. This occurs in some dogs with lumbosacral disease due to abnormal movement of the vertebrae, as well as pressure from the disc and other soft tissue structures. Treatment of lumbosacral disc disease is usually done by one of two techniques. The first is called dorsal decompression by laminectomy. This entails removing the bony roof of the vertebral canal in order to allow the herniated disc and any associated compressive tissues to be removed. This technique has good long-term follow-up information for both pet dogs and for working dogs. Overall success rates vary from about 80% to 90% although a significant number of working dogs may suffer from a recurrence of signs. The second technique relies on fusing the sacrum and the seventh lumbar vertebra far enough apart so that any soft tissues compressing the nerve roots are stretched out flat and the spaces between the bones are returned to a normal size. Although this is a very promising technique there are as yet no good long-term follow-up studies available. The prognosis is generally good for lumbosacral disc disease although long-term information is only available for decompressive surgery (above). The main complication is recurrence of clinical signs. Lumbosacral Stenosis. REQUIRES LOGIN; FOR VETERINARIANS In: Clinical Neurology in Small Animals: Localization, Diagnosis and Treatment. K.G. Braund. Lumbosacral Syndrome. REQUIRES LOGIN; FOR VETERINARIANS In: Clinical Neurology in Small Animals: Localization, Diagnosis and Treatment. K.G. Braund. Predictors of outcome after dorsal decompressive laminectomy for degenerative lumbosacral stenosis in dogs: 69 cases (1987-1997). De Risio L, Sharp NJ, Olby NJ, Munana KR, Thomas WB. J Am Vet Med Assoc. 2001; 219(5):624-8. Surgical treatment of degenerative lumbosacral stenosis in dogs. Danielsson F, Sjostrom L. Vet Surg. 1999 Mar-Apr;28(2):91-8. Force plate analysis before and after dorsal decompression for treatment of degenerative lumbosacral stenosis in dogs. Van Klaveren NJ, Suwankong N, De Boer S, Van Den Brom WE, Voorhout G, Hazewinkel HA, Meij BP. Vet Surg. 2005 Sep-Oct;34(5):450-6. Magnetic resonance imaging of articular process joint geometry and intervertebral disk degeneration in the caudal lumbar spine (L5-S1) of dogs with clinical signs of cauda equina compression. Rossi F, Seiler G, Busato A, Wacker C, Lang J. Vet Radiol Ultrasound. 2004 Sep-Oct;45(5):381-7.